All our guests must present an international passport upon check-in. 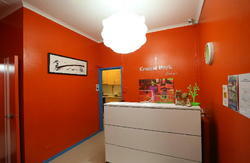 Welcome to G'Day Backpackers Hostel Sydney Australia, the Global Village in the heart of Sydney! Our beautifully restored Victorian style terrace is located in the hip inner city suburb of Woolloomooloo famous for its bars, clubs, pubs and sheik eateries. G-DAY is only a 5-10 minute walk to the heart of the city and to Sydney's main tourist attractions the Opera House, Harbour Bridge, Botanical Gardens, Bondi Beach, Art Galleries and more. Woolloomooloo (if you can say it) is the place to be! Nestled between the buzzing district of Kings Cross, the yuppie suburb of Potts Point and the gorgeous surrounds of Sydney Harbour, we guarantee an enjoyable stay. We have all the rooms that any backpacker could ask for from 6-12 bed dorms (all female and mixed) or double/twin rooms. Rooms are cleaned daily. Dorm Rooms: have 3, 4, 5 or 6 bunk beds (6-12 people) with shared bathroom. We offer extra special rates for weekly stays. If you are working in Sydney this is a great opportunity to take advantage of these discounted prices while enjoying inner city life. Ladies - you have the choice of all female dorms or mixed. Whatever your needs, G'Day staff will assist you to ensure a safe and enjoyable stay! Relax in G'Days leafy courtyard for a free breakfast or an afternoon drink under the fantastic Sydney sunshine. This cozy outdoor spot gives you the chance to meet other travelers and make new friends. Like you, our friendly staff are from all over the world and are here to make your stay as comfortable and homely as possible. They can help organize travel, book tours or provide general information on what to do and where to go in Sydney and Australia. Reception is open from 8am-12noon and 4pm-8pm with 24 hour guest access. Check-in is after 12pm, Check-out is at 10am. We provide a free transfer from Sydney Airport to G-DAYs front door when you book for 3 nights or more! Cash, credit cards and EFTPOS are all accepted. Listed prices apply for internet bookings only. We look forward to welcoming you to Sydney!!! 5 minutes walk from Kings Cross train station, 10 minutes from Museum and St James train stations. Buses stop at the corner of Forbes and William Street. On arrival in Sydney take advantage of our FREE transport service from the airport to G`Day backpackers(between 8am and 8pm). Let us know so we can arrange to meet you.Valid for reservations of more than 3 nights! Please remember; do not pay the driver, we`ll sort that out with the shuttlebus company. By Train. Jump on the City Rail network anywhere in Sydney and go to either Central Station or Town Hall Station. Change to the Eastern Suburbs line for Kings Cross Station. As you emerge out of Kings Cross Station turn right to walk down Victoria Road where you'll come to a large intersection with a road tunnel going underneath and two gigantic Coca Cola signs stuck to the side of a building. Turn right to walk towards the city on William Street. Forbes Street is only a few blocks down on the right. By Road. Make your way from the city centre to Hyde Park. From there follow William Street east. Before you ascend the hill to Kings Cross turn left down Forbes Street. If driving, make sure you don't go through the tunnel as it is difficult to navigate your way back. Also try to avoid driving in peak hour times - 8 to 9am & 4 to 6pm. Buses run up and down William Street regularly, and stop at the corner of Forbes and William Street. Taxis from the city cost around $15 to $25.